I was recently talking with a friend of mine from Rice who is now working in Brownsville, Texas, which is near my hometown of Los Fresnos, and she said there is nothing to do there, which I must admit compared to Houston is pretty true. However, my experience growing up was not boring in the slightest because I took pleasure in some of the finer attractions the Rio Grande Valley offers: good farm and ranch land, great fishing, and some of the nicest white-tails around. Knowing this, I simply told her there is plenty to do, as long as you go outside and enjoy the wildlife and geography of a very special region – or just spend all her time at South Padre Island. That brings me to a birding trip I took recently with a class of mine at Brazos Bend State Park, where I was reminded of home. I was standing along the path looking at moorhens and coots on 40 acre lake, when I started looking through my binoculars and noticed a bird that was different from the coots it was swimming around. I knew it was a duck, but couldn’t make it out because of low-light conditions, and then I was told it was a blue-winged teal (Anas discors), and I felt like I should have recognized it immediately. The blue-grey head with a white crescent behind its bill are characteristic signs of the male. They also have a brownish-cinnamon body with black speckles and a white patch near its rear to give them their fully distinct look. Goes to show I no longer spend my time at home in South Texas anymore, where I have watched migrations of ducks and geese since I was a kid. Watching them brought me back to fall fishing in the bay in Arroyo City, which borders the edge of the Laguna Atascosa Wildlife Refuge, which has documented 413 species of birds and harbors plenty of other wildlife to see. The pair I observed remained fairly close together the entire time, with the female appearing to be following the male the majority of the time. However, they were not separated by more than 3 feet for approximately 90 % of the period of time I observed them. Blue-winged teals are dimorphic, and the females lack the characteristic blue head and the white body patch of the males, but have bluish-green coloring on their wings. The pair was mixing in among some American coots for most of the time, and would submerge their head and body into the water to forage leaving their tails popped out in the air. While they were foraging, I had to get over the feeling that they were mooning me, and I would look away as if to give them some sort of privacy; kind of like I do when I take my dogs outside to do their business. The ducks are migratory birds and among the only North American birds to migrate as far as South America. Because of their migration patterns they have many habitats they must adapt to, and are exposed to various conditions of food resources and diseases. Two papers, one by Juthatip Keawcharoen and another by Bjorn Olsen and colleagues found that Blue-winged teals are among the most common duck species infected with Influenza A, known more commonly as avian flu. As you may remember a few years ago the threat of avian flu was a world heath issue which affected many countries, particularly China. They found that blue-winged teals have a higher infection rate in the United States following their spring migration from South America. Keawcharoen and colleagues experimentally infected six duck species, among then the common teal, and found that species belonging to the Anas genus, did not display negative effects upon infection with the highly pathogenic influenza a virus; meaning they could still migrate with the virus and possibly infect other animals along their migration routes. Up until reading these papers I never thought of disease being spread by wild migrating birds that much, especially something like influenza A. I mainly thought of diseases being spread by insects, like ticks and mosquitoes, even though I took a class where I learned the SARS virus was transferred to humans from a palm civet. Blue-winged teals, like most bird species go through a molting phase after breeding where they lose their feathers and with it the ability to fly. David Saunders, along with his colleagues has studied the changes in muscle mass in blue-winged teals. His research has shown a particularly interesting mechanism by which blue-winged teals lose muscle mass after molting. He observed the loss of muscle mass is not caused by nutritional factors, but rather what he believes is a survival mechanism. As molting begins flight muscle mass decreases significantly while an increase in leg muscle mass increases, which allows for them to be better swimmers and escape predators while they are flightless. Once the new feathers are almost fully formed, leg muscle mass decreases while flight muscles alternatively increase allowing the ducks to fly as soon as possible, even when the flight feathers are not fully formed. In addition, David Saunders showed certain enzymes that affect muscle performance like citrate synthase and lactate dehydrogenase change during the time period to allow for maximum performance in periods during flight and flightless periods. In addition other factors affecting blue-winged teals have been heavy metal concentrations due to chemical run-off and remnants of the era of lead shot being used by hunters. Of particular concern is Selenium, which has been shown to be detrimental to the health of the ducks. Overall, I really enjoyed the opportunity to view these blue-winged teals and learn more about them than I had known. After the trip, I called my parents, and we got to chat about “the good ole’ days,” and it brought a nice end to a great trip. Fedynich, A. M., B. M. Ballard, and T. J. McBride. “Arsenic, Cadmium, Copper, Lead, and Selenium in Migrating Blue-Winged Teal ( Anas Discors L.).” Environmental Contamination and Toxicology 53.4 (2006): 662-66. 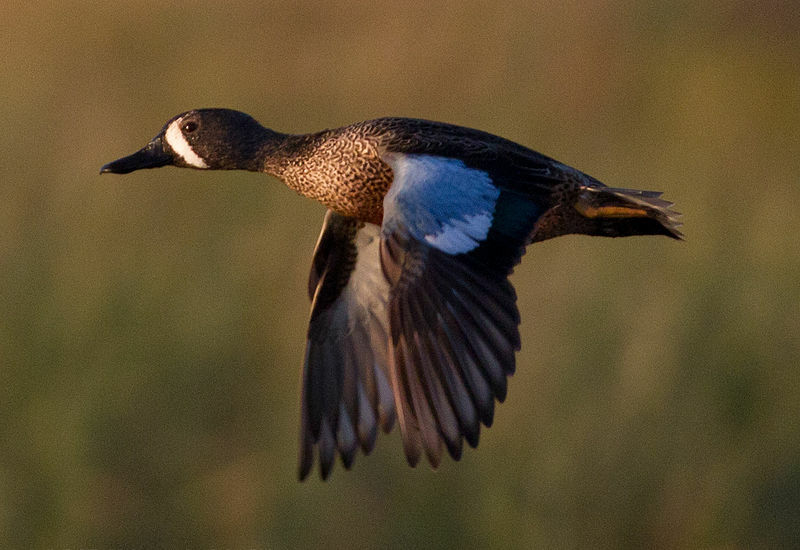 This article focuses on the levels of metal and chemical compounds found in blue-winged teals passing through south Texas. They found that copper and selenium were particularly high in migrating birds, and selenium has been shown to be harmful to the ducks. Brown, Richard E., and David K. Saunders. “Regulated Changes in Body Mass and Muscle Mass in Molting Blue-winged Teal for an Early Return to Flight.” Canadian Journal of Zoology 76.1 (1998): 26-32. Print. This article was found in the Rice University Library stacks, and was unavailable in print online because Rice does not have an online access to the journal. 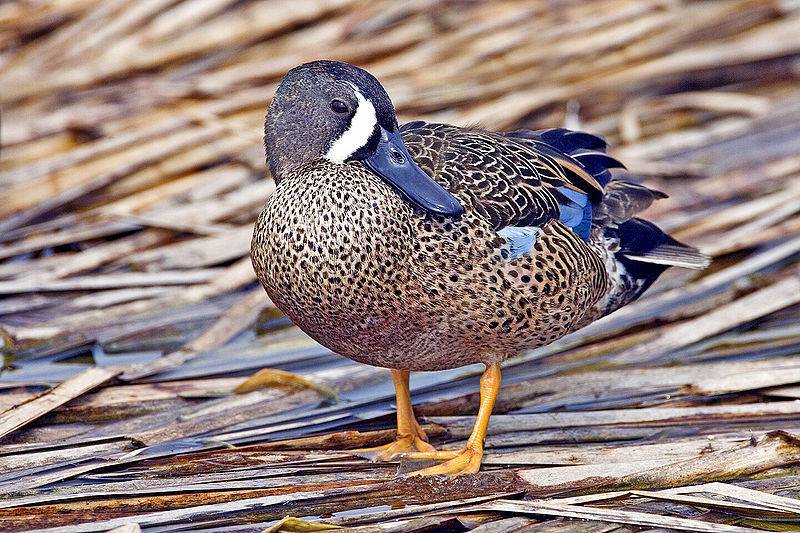 The article discusses the changes in muscle mass of blue-winged teals related to different stages of molting , and discusses possible reasons for the changes. Keawcharoen, Juthatip. “Wild Ducks as Long-Distance Vectors of Highly Pathogenic Avian Influenza Virus (H5N1).” Emerging Infectious Diseases 14.4 (2008): 600-07. The researchers experimentally infected six species of ducks to see if they could carry the highly pathogenic influenza A virus and not be critically sick. Olsen, Bjorn, and Vincent J. Munster. “Global Patterns of Influenza A Virus in Wild Birds.” Science 312.5772 (2006): 384-88. This paper looks at the distribution of Influenza A in a variety of wild bird species and their distribution. They found many bird species carry influenza A virus and in blue-winged teals, a higher rate is observed during spring after their migration from South America. Saunders, D., and R. Klemm. “Seasonal Changes in the Metabolic Properties of Muscle in Blue-winged Teal, Anas Discors.” Comparative Biochemistry and Physiology Part A: Physiology 107.1 (1994): 63-68. This paper looked at the mechanisms behind muscle mass changes in blue-winged teals observed before, during, and after molting. The authors looked at enzymes that affect muscle and aerobic performance, such as citrate synthase, lactate dehydrogenase, and aerobic capacity. The figure above shows the migratory patterns of wild bird populations from Olsen and Munster in their 2006 paper published in Science. The shaded regions in parts B and C correspond to the migratory range of the blue-winged teal. 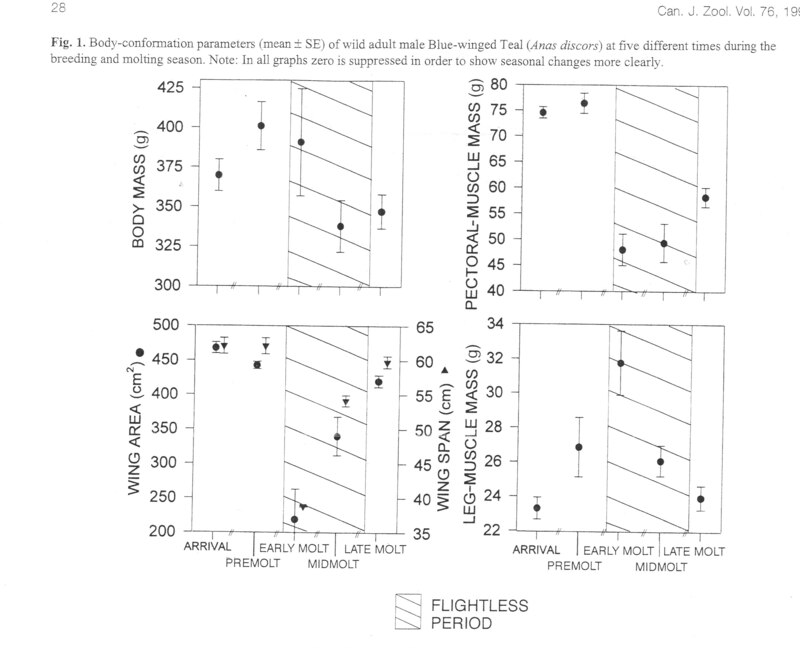 This figure, from a 1998 paper by Richard E. Brown and David K. Saunders shows the documented changes in muscle mass and wing area before, during, and after molting. All observed changes were significant, showing there is a specific mechanism by which the body conformation changes in blue-winged teals associated with molting.